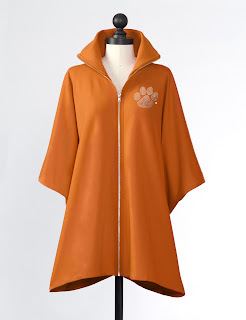 We are so excited to introduce you to this new fashion brand today, and once you see their super affordable Clemson gameday attire, you will be excited too! Recently we were contacted by online boutique Meesh & Mia and they asked us to help get the word out to Clemson Girls about their big selection of Clemson shirts, skirts, sweaters and of course our favorite…dresses. One look at their super cute and versatile selection and we were more than eager to introduce you to them. The great thing about Meesh & Mia’s clothes is that they can be worn for Clemson games, but also year round for work, class, etc. They combine comfort and chic. I’m having trouble narrowing down what I want to buy – I want it all! 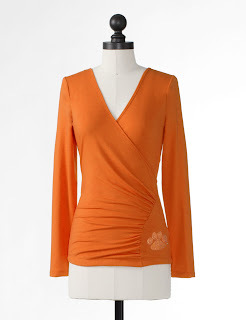 Check out this gorgeous faux wrap top with rhinestone tiger paw – it’s also available in orange too of course. How cute with this be with skinny jeans, flats and a statement necklace? 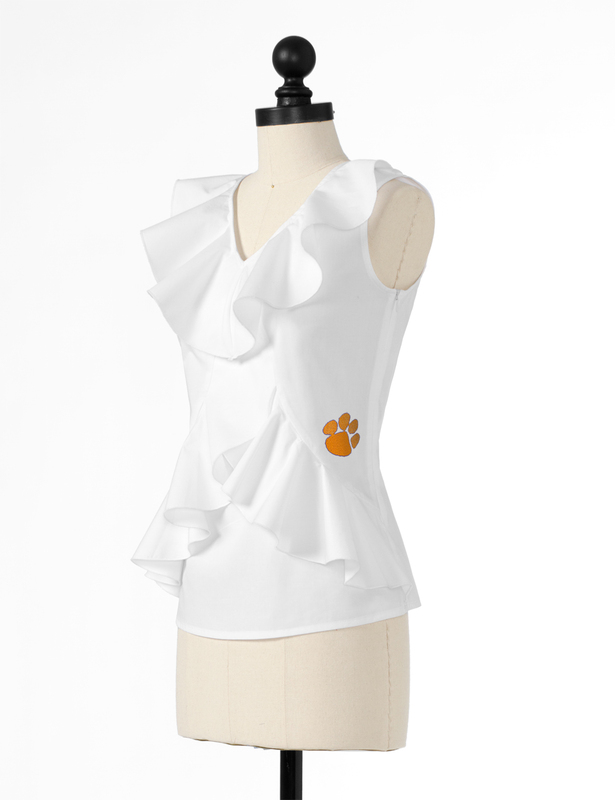 I am so in love with this Clemson ruffle white tank – it’s so unique. 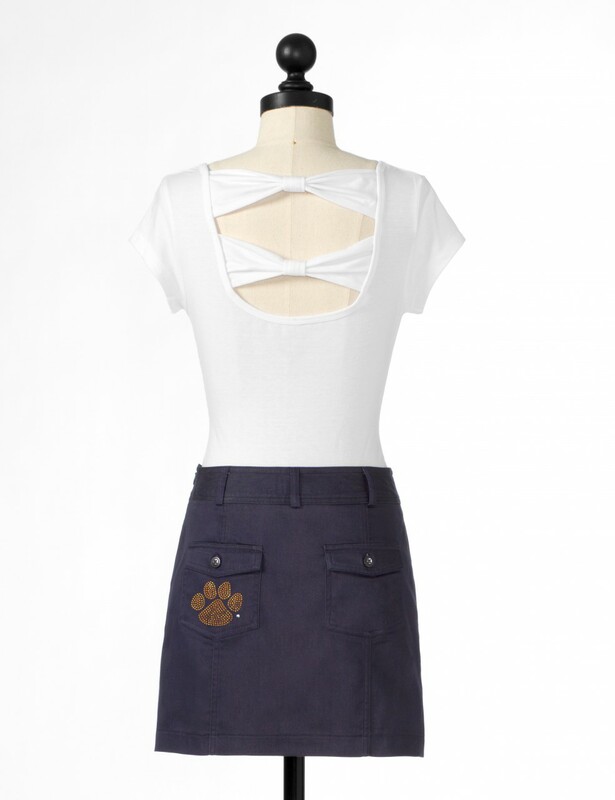 And how good would this look paired with Meesh & Mia’s Clemson denim skirt – yes, a Clemson paw print denim skirt. Love! They also carry this super cute Clemson t-shirt dress in several colors – including orange and purple of course. 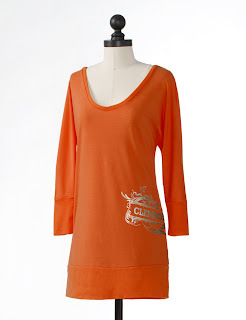 :) This dress looks so comfortable and would be great paired with brown tights and brown boots for the Fall. 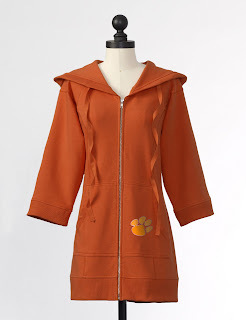 Or, stay cool in the Spring and pair it with your favorite pair of Clemson flip flops. 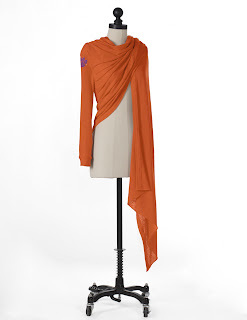 I think I would probably wear this to lounge around the house too… And guess what? This dress is only $45! And before we start dreaming about Spring weather, make sure you keep warm now – Meesh & Mia have us covered for outwear too! 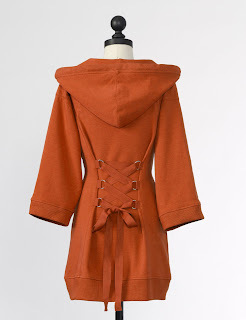 What do you think about this lovely, hooded zip up tunic? The back is the best part – love the lace-up corset detail. A fitted coat that shows off your curves? Yes please. And cape-style coats are very on trend this year – especially paired with skinny jeans and boots. It really creates a dramatic, head-turning look… you will definitely turn heads in this gorgeous orange, Clemson cape from Meesh & Mia with the rhinestone Clemson tiger paw. Finally, I think this Meesh & Mia signature flair tie cardigan is a must-have for every Clemson Girl. This chic orange cardigan is versatile enough that you can wear it all football season in different ways and you’ll look like you have on a new outfit every time. Watch the video from Meesh & Mia below to see a few of the fun ways you can style this cardigan…. 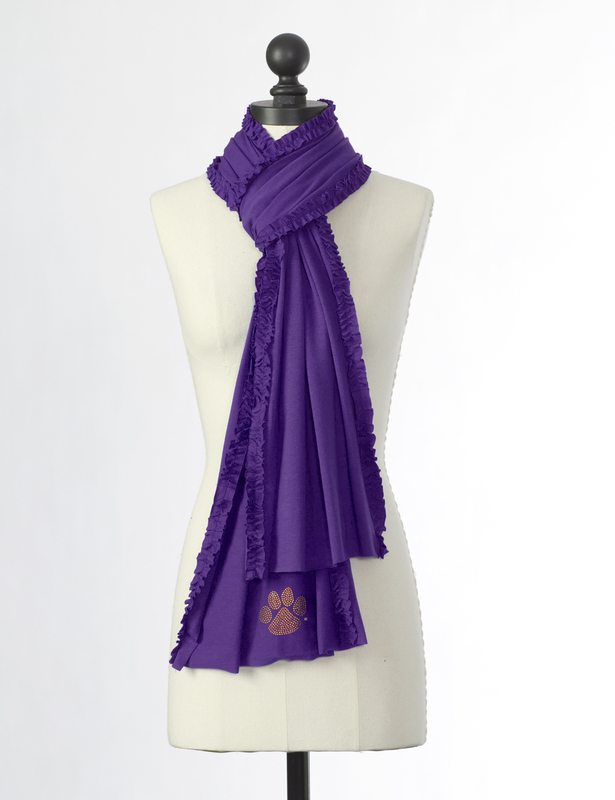 Meesh & Mia wants you to spread the word about their great Clemson fashion – and they will reward you when you do! All you have to do is refer a friend to the site through their Refer a Friend program, and when the friend buys something, you get a $15 credit to spend on the site… refer two friends and get $30… refer three and get $45….and so on, and so on… How cool is that? You can follow Meesh & Mia’s blog and see how they style their apparel for really cute gameday looks. Meesh & Mia would like to give one very lucky Clemson Girl a gift certificate for $50 to use on Meesh & Mia’s website. Post a comment on this post with your first name, last initial and where you are from (1 entry). Follow Meesh & Mia on Facebook and post on this photo on their profile “Clemson Girl sent me!” (1 entry). Follow Meesh & Mia on Twitter, then tweet about this giveaway – include a link to the giveaway and copy @meeshandmia and @clemsongirl in the tweet (1 entry). Email a link to this giveaway to two friends and copy clemsongirlblog@gmail.com (1 entry). Deadline for all entries will be tonight, Wednesday, Jan. 18th, at 7pm EST. We will compile all of your entries, randomly draw a name and post the winner’s name on the blog around 8:30pm EST. The winner will have 48 hours to contact us or we will draw a new winner. 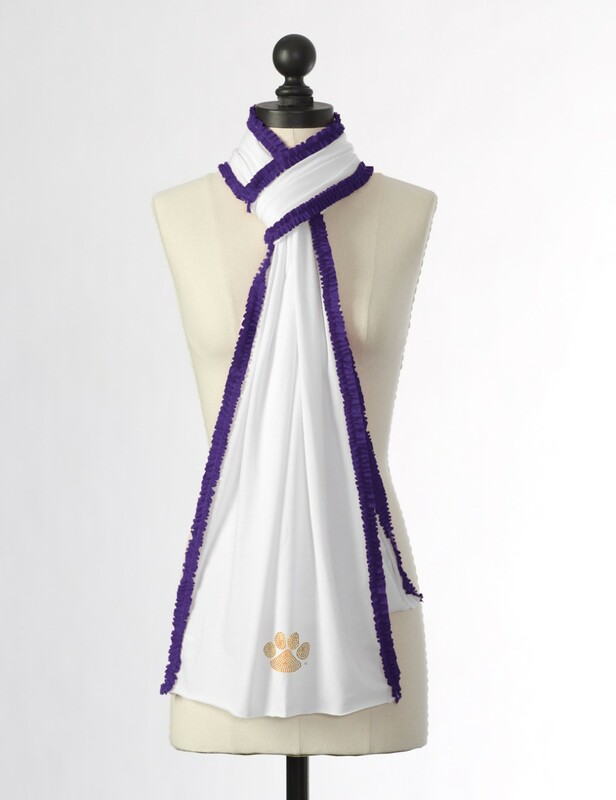 We hope you love Meesh & Mia’s Clemson gameday apparel as much as we do… good luck and Go Tigers! Shared on facenook. Karen R.
Shared a post for Meesh & Mia. Allison A., Lexington SC, shared on facebook. Shelley M. From Gilbert, Sc. I shared the link on Facebook! Natalie V. from Mount Pleasant, SC!